Thurso is mainland Scotland's most northerly town, and home to the country's most northerly railway station. Located on the north coast of Caithness, its seaward views are dominated by the distant cliffs of Dunnet Head to the north east, and those of the island of Hoy, one of the Orkney Islands, to the north. Modern Thurso tends to be seen as a stepping stone en route to somewhere else rather than as a destination in its own right, although in recent years the sometimes turbulent seas of the Pentland Firth have led to the town becoming an unlikely focus for fans of surfing from all over the world. 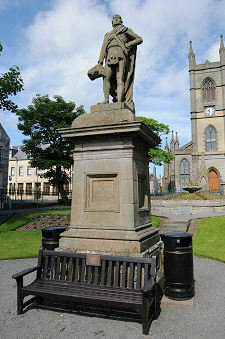 Thurso has long been a gateway to Orkney, with the best established of the ferry routes to Orkney, the car ferry to Stromness, leaving from the harbour at Scrabster, a mile and a half to the north west. Thurso is also a point of departure for those embarking on the best scenic route Scotland has to offer, the 140 miles taking in the north and west coasts via Durness to Ullapool. In the 1970s this route comprised sometimes tortuous single track roads the whole way and included a ferry crossing (or a 100 mile detour along more single track roads) at Kylesku. The arrival of the Kylesku Bridge and many stretches of road wide enough to boast white lines down the middle have made the far north west much more accessible. But the utterly superb scenery the area has to offer remains: and there also remain some stretches of single track road to add interest to the trip, especially around Durness. If you are intending to go this way, make sure you have filled up with fuel before heading west from Thurso. In more recent times this route, albeit usually travelled in the opposite direction, has formed part of the North Coast 500. 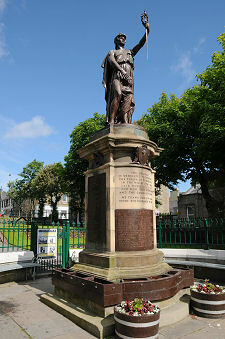 Thurso's origins are revealed in its name, which comes from the Old Norse for Bull's River. The Vikings were well established here from as early as the 900s, using the river mouth as a port and a fishing base. After Caithness became more securely part of Scotland in medieval times, Thurso continued to grow around its fishing and trade, in a triangular area formed by the River Thurso to the south east and the shore of Thurso Bay to the north. This area is still known as Old Thurso or the old town. Not a great deal remains of medieval Old Thurso except for the roofless Old St Peter's Church. Parts of this date back to the early 1100s and it seems to have been expanded and altered at various points over the next seven centuries before being abandoned in 1832. After a period of closure, Old St Peter's Church and the surrounding churchyard are again open to the public, and are well worth a visit. Nearby Shore Street is very picturesque, and Thurso's seafront is well worth exploring. From here you can see the rather sad remains of Thurso Castle on the eastern side of the river mouth. On the site of earlier castles dating back to the 1100s, this was largely replaced by a grand Scots Baronial mansion in the 1870s. It caught fire and was subsequently partly demolished in 1952. Elsewhere in the old town is a fine example of how an outstanding visitor attraction can be created, in the form of Caithness Horizons, a modern museum housed in the old Town Hall and Carnegie Library. This brings together what were previously three separate collections under one roof and is a "must see" for anyone in northern Caithness. 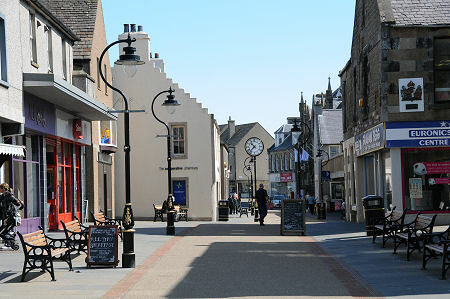 If you follow the pedestrianised High Street and Rotterdam Street south west from Caithness Horizons you move into Thurso's new town. This was created in the years from 1798 by Sir John Sinclair of Ulbster, using wide streets laid out on a regular grid. This grid remains in place today. At its heart is what is now known as Sir John's Square, in which you find a statue of Sir John Sinclair. This is slightly eclipsed by the impressive war memorial at the south east or lower end of the square. The upper end of the square is filled by the Gothic splendour of St Peter's and St Andrew's Church. This was completed in 1832 by the architect William Burn, at which point Old St Peter's Church became redundant. 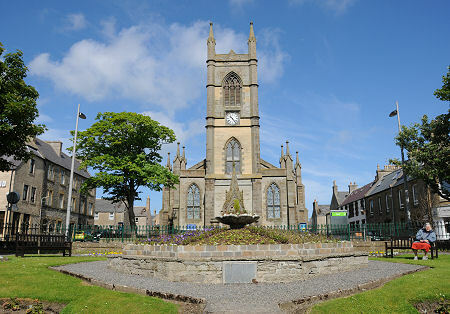 Other things to look out for in the new town include Meadow Well, a circular wellhouse completed in 1823, and the fine public library, originally the Miller Institution, which since it was completed in 1862 has terminated the view down the length of Traill Street, one of Thurso's main through streets. Less obvious is the impressive Janet Street overlooking the River Thurso close to Thurso Bridge. Thurso's most recent bout of growth followed the establishment from 1954 of the Dounreay Nuclear Power Development Establishment at a disused wartime airfield eight miles to the west of the town. At its peak in the 1970s Dounreay employed 3,500 people, many of whom lived in Thurso. Employment levels have declined since then, but the task of decommissioning the establishment will ensure a significant contribution to the economy of the area for decades to come.